Delicate, tender, and bursting with spring sweetness – the flavour of asparagus just can’t be beaten. It’s the ultimate challenge for an organic grower, but this veg delicacy is worth the trouble. Steam gently, then dress with melted butter and a scrunch of salt and pepper. Irresistible. 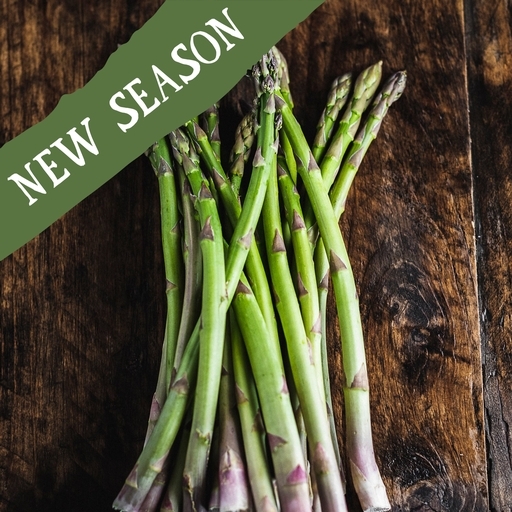 A little ahead of the British season, we enjoy a beautiful asparagus crop from Spain, providing some welcome greenery to perk up our plates before homegrown crops arrive. Our top tip for prepping asparagus is to hold the stalk at either end and bend it gently. It will break naturally at the point where the stalks become woody. The bases add lovely flavour to homemade stock. Asparagus cooks quickly: 2-5 mins to steam or boil, 5 mins to grill or griddle, and 8-12 mins to roast (the best way to lock in the flavour). Its short cooking time also means it can be added to stews, risottos and pasta sauces just before they’re done. Store asparagus in the fridge. Best eaten as soon as possible – to keep it fresh, you can stand asparagus upright in a pot with a little water. Straight from the farm, so wash before cooking. In boxes from early May to mid/late June - one of the first signs of spring. We begin the season by importing from Pepe in Spain until the UK season catches up.